It has been 7 years since we started the Scoop.it adventure. From the very beginning when Scoop.it was a simple innovative content curation tool to the powerful comprehensive content monitoring suite we offer today, from our first few beta testers to the 5+ million users we now have, and from being an early-stage startup to finding a sustainable business model, it’s been an amazing journey. At the end of 2017, we took a new step and launched our content intelligence solution. Our ambition was to go further than filtering the web. We wanted to use artificial intelligence to analyze the tens of millions of content sources that we crawl with Scoop.it. In doing so, we aimed at better understanding the topics this content is about and derive meaningful and data-driven insights for marketers. This shift has driven us to the next big thing: today, I’m super excited to let you know that Scoop.it has been acquired by Linkfluence, a leading social listening company. Like Scoop.it, Linkfluence has built technology to crawl, index, and analyze content through artificial intelligence. But while Scoop.it focuses on online media content such as blogs, news sites, or video platforms, Linkfluence focuses on social listening to help marketers understand their customers and the perception they have of their brands. To do that, Linkfluence analyzes and filters hundreds of millions of public conversions on the social Web every day. Of course, given this volume of data, artificial intelligence such as natural language processing – a type of which Scoop.it has been working on – is critical. Combining both R&D teams will help Linkfluence go faster building the next generation of AI models to derive meaning from the social Web. Another thing Scoop.it will bring Linkfluence is a US presence. While Linkfluence has been tremendously successful with global brands in Europe and Asia, it still needs to set foot in the US. 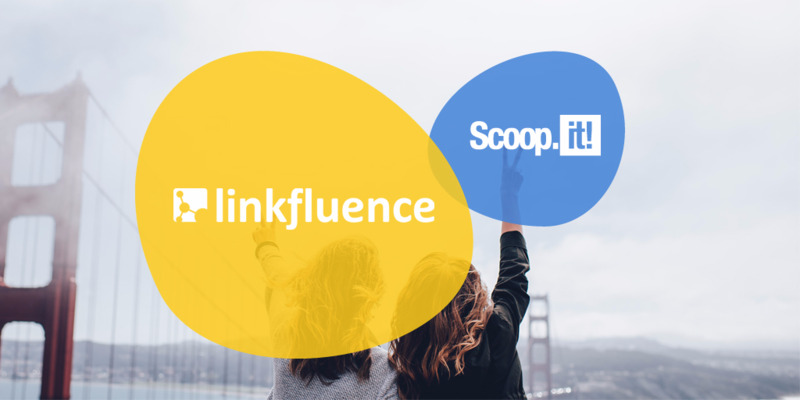 The Scoop.it HQ in San Francisco will become the first US office for Linkfluence, enabling it to serve the group’s clients all across the world from 6 offices: London, Paris, Düsseldorf, Singapore, Shanghai, and now San Francisco. From the Scoop.it end, there were many things we liked in Linkfluence as well. First, we share the same long-term mission of building technology to understand the Web. Second, Linkfluence has built a great multicultural team across Europe and Asia with a company culture very close to ours. Third, Linkfluence has established strong relationships with global brands with a unique business model that combines technology packaged as a SaaS platform together with research services provided by a team of 100+ analysts. The ability to operate their own technology generates tremendous value for global brands and it’s been a model we’ve looked at developing at Scoop.it as a way to bypass the learning curve of a new platform. And there was one more thing. As Linkfluence’s previous CEO wanted to step down, the board was looking for new leadership with the mission to develop the company in the US. Given the above points, I felt very excited when they offered me the position and I’m happy to share that I accepted the challenge and have been appointed as the new CEO of Linkfluence. What will happen to Scoop.it? This deal brings a lot of synergies, the most obvious ones being at the technology and platform level and we’ve already started to implement them. At the product level, we want to keep Scoop.it a standalone product given its unique user experience and its specific focus on content curation. So if you’re an existing user or client or if you’re considering using Scoop.it in the future don’t worry, Scoop.it is sticking around and will keep offering its well-known simple and powerful content curation experience. At the team level, we’ll keep offering a high level of support to our valuable clients and users and continue to offer technology that enables you to research and publish the best content both for marketing and knowledge sharing purposes. And as Linkfluence is also announcing $21 million in new funding, Scoop.it is joining a sustainable company in the marketing technology space. On behalf of the entire Scoop.it team, I want to thank you all for your trust. We could never have gotten this far without our investors who got us started in tough conditions, our early adopters who gave us early feedback and validation, our millions of users who kept pushing us to be better and better and of course the many business and companies who became customers of Scoop.it and trusted us with strategic content projects. We’re immensely grateful to all of you and we’re looking forward to continuing this great journey together. 11 Comments on "Scoop.it joins Linkfluence to become a leading global social intelligence company"
Happy to see this site reach new heights. I have long admired Scoop.it. Wonderful product and brand, so best wishes for the future. Congrats guys, from a long-time user of Scoop.it! Right strategy – right timing. Content curation and social listening are both hot topics right now in the MarTech pool (in which I swim) and the ability to recognize, and invest in, the core technology that will sustain both fields is a KPI.